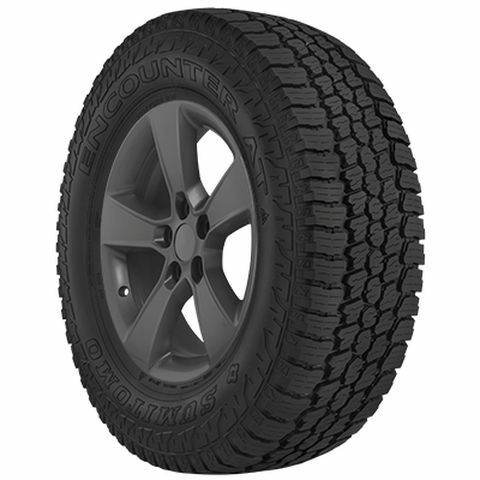 The all-terrain Sumitomo Encounter AT is designed for light trucks and SUVs. It features a sturdy construction with rigid, rugged blocks optimized to provide quiet, comfortable highway rides and extreme off-road traction. The block shape and arrangement of this all-season tire grips firmly on rocks, gravel, ice, and snow. The optimized voids channel mud, slush, and water from the contact patch to improve safety and traction. Purchase includes the Sumitomo Encounter AT tire only. The wheel rim shown in the picture is not included. Picture provided is a stock picture from the manufacturer and may or may not reflect the actual product being ordered. All Sumitomo Encounter AT tires are continuously developing with manufactured improvements. With that said, Simple Tire and the manufacturers have the right to change these tire specifications at any time without notice or obligation. Please Note: Specifications of the Sumitomo Encounter AT tires shown above are listed to be as accurate as possible based on the information provided to us by Sumitomo tires. WORST TIRES I HAVE EVER BOUGHT! CAN NOT KEEP THEM BALANCED. Went back to my worn out Toyo's to get rid of the vibration. These tires are Amazing they were affordable, Arrived Quickly, And superior In quality!! Thanks Simple tire, My new Dependable and Professional Tire Distributor!! By submitting a review, each person received a sweepstakes entry.